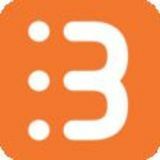 Status Status is where you go to respond to requests, unlike Notifications where you are only being notified, Status page is where you take actions on your pending requests. Accept or Reject requests by using the drop-down menu. Pending - list of Individuals or companies that have requested to view your contact information Accepted - individuals or companies you have allowed to view your information that have been set to non-viewable under your privacy setting Rejected - list of individuals or companies that you have declined the request to view your contact information To stop receiving requests, go to Employment Availability under Personal Details and set to RED. 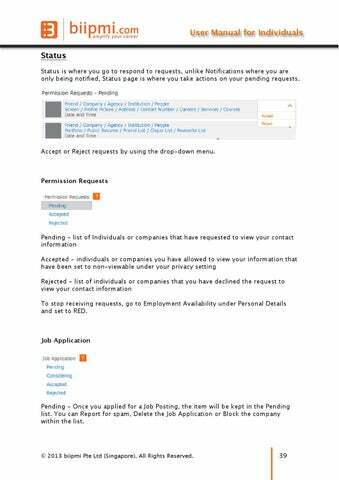 Pending - Once you applied for a Job Posting, the item will be kept in the Pending list. You can Report for spam, Delete the Job Application or Block the company within the list.